In this much-anticipated second volume on transport logistics, industry veterans Issa Baluch and Charles Edwards make a compelling case for the starring role of transportation and logistics on the world’s economic and social stage. 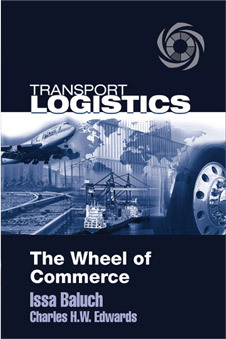 The Wheel of Commerce examines the impact of the 2008 recession on the industry, and presents remarkable case studies of 11 countries, including six in Africa, that are developing infrastructure to move goods from their raw states through manufacturing, and to support imports and exports. In this far-reaching and authoritative look at transport logistics, industry veterans Issa Baluch and Charles Edwards show how the complex systems of moving and delivering goods all over the world – in all kinds of weather and over all types of obstacles – an boost the economies of countries large and small, fully developed or struggling to get there. In the book’s third and final section, Mr. Baluch looks at the future of the transport logistics industry, which will continue to evolve as a result of globalization, the digitalization of information, new technologies, rising energy costs, and changing trade patterns. He also presents railways as the eco-friendly freight solution of the future, especially in the Middle East and Africa. Transport Logistics concludes with an emphasis on the importance of training and the role of national and international associations in developing a culture of quality, security, and innovation in the freight logistics profession.